White Noise: Chevy Bolt a contender? Not so much. Chevy Bolt a contender? Not so much. So, other car companies are finally competing with Tesla and making all-electric vehicles. 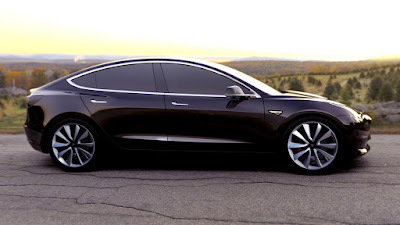 The market is ripe for this, considering that the Tesla is selling as well as it is for CAD$100,000+. So it was with great interest that I heard Chevrolet has finally released the Bolt EV. To summarize, the Bolt is a small car (smaller than the Leaf, bigger than a Fiesta). It has a range of 380 km. It can charge in 9.5 hours on 220 volts. So this is the first car with this type of range, to be sold in all North American markets for under $50,000. In fact, you can get in a Bolt for CAD$45,000, but without any options. A loaded model is CAD$51,500+. I'm not including incentives, because in certain parts of Canada, such as here in Alberta, we don't get any. So they beat Tesla to market on a consumer level car. But I predict that Bolt owners are going to have some serious buyer's remorse once the Tesla Model 3 arrives late this year (or mid-2018 if you order now). Here's why. The Model 3 (pictured) will have slightly less range (346 km), and it is expected to sell for US$35,000. Canadian pricing is pending, but based on other Tesla models, they'll probably go at the current exchange rate, which right now is CAD$46,625. There are a few things, though, that a Model 3 owner will get, that a Bolt owner won't. More room. It's just a bigger, more practical car. You'll not likely go on a long trip in a Bolt, but in a Model 3 you could. I've heard reviews saying the Bolt isn't very comfortable and has narrow seats. I'm thinking this won't be an issue in the Model 3. OMG - the ever expanding Tesla Supercharging network. At an electricity cost of $0.16 per kWh, which is expensive, you could get an 80% recharge in 40 minutes for $6.40 at a Supercharging station in Montana. My guess is that in Alberta, that would be at least half the cost, since we're paying $0.04 per kWh in Alberta right now. You also get 400 kWh of free charging credit per year. There are no Chevrolet charging stations. Chevy lists charging stations you could use, but they're not all public nor freely accessible. Based on the reviews I've seen, the Bolt's navigation system is nowhere near as sophisticated as Tesla's. In a Tesla, the car will not only help you plan and drive your route, but it also knows where all the Supercharging stations are and factors that in, while showing you on the map how much farther you can get on the current charge. But the real deal maker will be the self-driving ability. Yes, Tesla intends to put that in the Model 3 (for an extra cost of course). The Bolt has nothing like that. Here's what this brings to the table. Even without the full self-driving option, the Tesla will match speed to traffic conditions, keep within a lane, automatically change lanes without driver input, transition from one freeway to another, exit the freeway when your destination is near, self-park when near a parking spot, and be summoned to and from your garage (opening and closing the door too). If you get the self-driving option, all you'll need to do is get in your car and tell it where to go. If you don't say anything, the car will look at your calendar and take you to the assumed destination of any meeting or appointment, or home if nothing is on the calendar. The car will figure out the optimal route, navigate urban streets (even without lane markings), manage intersections with lights and stop signs, even roundabouts. It will handle densely packed freeways at high speed. When you arrive, simply get out at the entrance and the car will seek a parking spot and park itself. Use your phone to summon it back to pick you up. Sorry Bolt, if I'm in the market for an electric car, I'll wait for the Model 3.